Editor’s note: This article has been updated to include an interview with Tyra Banks. Modeling costs, baby! 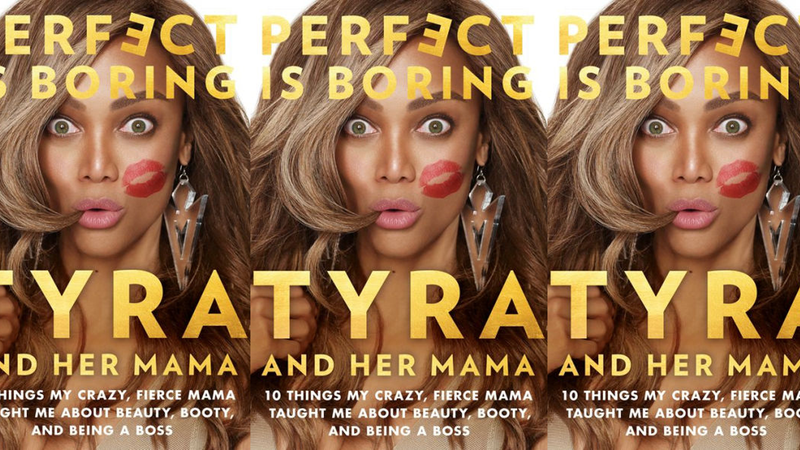 Perfect Is Boring, the new book from Tyra Banks and her mother, Carolyne London, a former nurse and photographer-turned-Tyra’s-sometime-manager-and-always-confidante, details the pitfalls of both Tyra’s life and career, and gives advice on finding ways to pick yourself up from the ups and downs. It’s as much for young women as it is for mothers and daughters to learn how to communicate and understand each other. I can tell you firsthand that Tyra Banks and her mom have one of the healthiest mother-daughter relationships I’ve ever seen—inside or outside the fashion business—and especially as “momager” and model. The Glow Up: What are three of the most important things that you and your mom have learned from each other about staying sane in the business? Tyra Banks: Sane? That might be a stretch … you know my mama and I are CRAZY! But this business is tough. In most cases when people talk about a brand or product, it’s about the brand or the product. In the entertainment industry, we learned early on that I am my product. My body, my face, my personality, my private life, is my product. And if you don’t like what people are saying, you can either tweak it and stay the course, or find a different audience that will appreciate what you have to offer. And lastly, I took my work as a model very seriously. It’s called the modeling business, not modeling playtime. When work was over, I didn’t party and stay out late; I went home and put my booty to bed so I could be energetic and ready to tackle the obstacles that stood in the way of my goals the next day! TGU: What do you wish you and your mama had known going into the business? TB: For both myself and my mama, we wish we’d known how competitive it would be. At that time, the industry only allowed for one black model at a time to be at the tippity top. It created some really unhealthy and super-painful situations for me. If we had known about the nature of the business that practiced “tokenism,” I could have been better prepared to deal with the personally heartbreaking outcome of that racism that was so prevalent. TGU: What’s the message you hope people take away from the book? TB: No matter what the situation was, my mama always had my back. I want people to feel like someone’s got their back after they read the book. By having conversations about taboo things or uncomfortable topics, it’s actually being real. I want them to have the confidence to reach out to their “mama”—whether or not it’s their actual mom or dad or auntie or BFF, etc.—and be able to talk about stuff that makes everybody at the dining room table blush. Among other things, mom and daughter promise on the book jacket that Perfect Is Boring is “more than a book, it’s a movement.” It promises to go beyond blushing about raw topics and helping you embrace your own unique beauty—and I think we can all take a page out of that book. The Glow Up tip: Perfect is Boring is out today, April 3, and available for order.